Peter Jackson will seek to avoid more negative reaction to the 48 frames-per-second cameras used to shoot The Hobbit by screening new scenes at 24fps in 2D. The director of the Tolkien-penned Lord of the Rings prequel is on his way to ComicCon in San Diego to showcase previously unseen footage. When the first clips were shown at the higher frame-rate at CinemaCon a few months ago, there was widespread condemnation of the visuals, with many claiming the 48fps footage looked "too real". Jackson says he wants the screening to be about the content itself, rather than the technical directions, but is convinced that come December the higher-frame rate will win out in the eyes of fans. On the New Zealander's Facebook page, he expanded on his decision to show the new clips at the same 24fps frame rate that cinemagoers are used to. He wrote: "When we screened only the 48fps reel at CinemaCon a few months ago, some bloggers focused stories, not on the content, but on their negative reaction to 10 mins of high frame rate footage. "This reaction convinced me that the only fair way to experience 48fps, is to sit down and watch a complete feature length movie, with a narrative, not quick trailer cuts. Do I want the ComicCon Hobbit stories to be all about 48 fps? Of course I don't. "I want to present footage from a movie we're all proud of, with terrific performances and I'm looking forward to seeing what you think." Jackson added that he's happy to "bet on himself" that the 48fps 3D movie experience will justify his decision to shoot the movie at the higher frame rate. 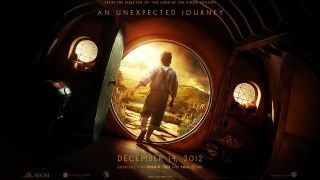 He says: "For me the experience of watching the full Hobbit movie in 3-D and 48 fps is something really special. Fully immersive, like stepping into Middle-earth. The screen disappears, and you enter the world of the movie in a vivid way. I love it. "The subject of high frame rates has serious film industry implications, and it's important that it's judged in the fairest possible context. "I'm afraid that a presentation of a short clip reel in a huge convention center is simply not the way to do it. "I'm sorry if people attending Comic Con were hoping to see a glimpse of 48 fps, but let me say that in December, if you choose to see the Hobbit in a great cinema, projecting the higher frame rate, you will be in the best place to make up your own mind."